Nestle UK has recalled a batch of its KitKat Bites and asked people with nut or peanut allergies to be especially vigilant following incorrect packaging of the chocolates. The company is recalling KitKat Original Milk Chocolate Bites pouch bags as they may have been incorrectly packed with peanut butter chocolates. Nestle said even though the packs are clearly labelled with “may contain peanuts and nuts” there is a risk to anyone with a nut or peanut allergy who may consume their contents without realizing. “Although these products are otherwise safe to consume we are making this recall as a precaution. This does not affect any other KitKat products,” the company said. The 104g KitKat Bites pouch bag is the affected product, with the line code 12311184 and batch code 70720457V2. The company urged consumers who have bought the chocolates to not to eat and return them to Nestle, with a full refund. Earlier this year, Nestle introduced peanut butter as a new flavour in its shareable KitKat Bites range. KitKat has been around for over 80 years and KitKat Bites were introduced in 2016. In February this year, the company ran a promotion for 56 days, allowing 56,000 lucky people to design their own KitKat packaging. Last month, Nestle USA recalled certain cases of Häagen-Dazs Chocolate Dark dark chocolate bars due to mismatched packaging. The company voluntarily recalled 82 cases of Häagen-Dazs 3 fl. oz. Chocolate Dark chocolate ice cream bars. 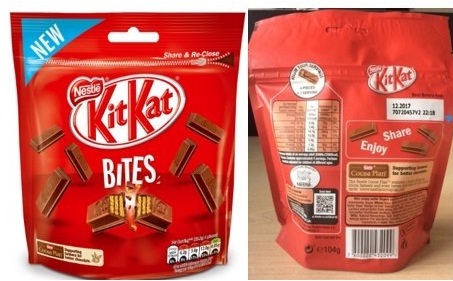 Image: Nestle UK recalls batch of KitKat Original Milk Chocolate Bites pouch bags. Photo: courtesy of Nestlé UK and Ireland.